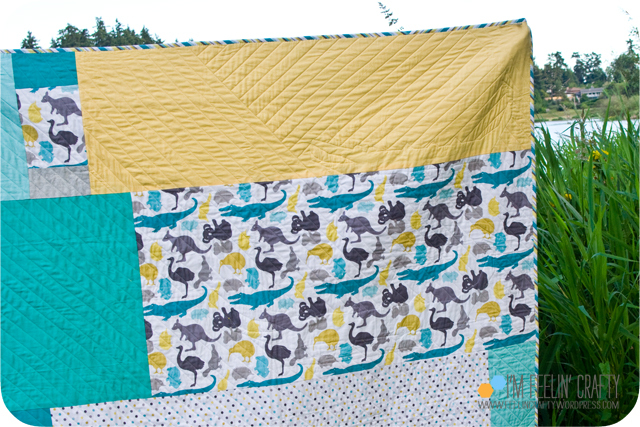 The ‘Gator Quilt Release Party! WoooHoooo! Finally! I’ve got my very first pattern to release today! Yea!! Party!!! 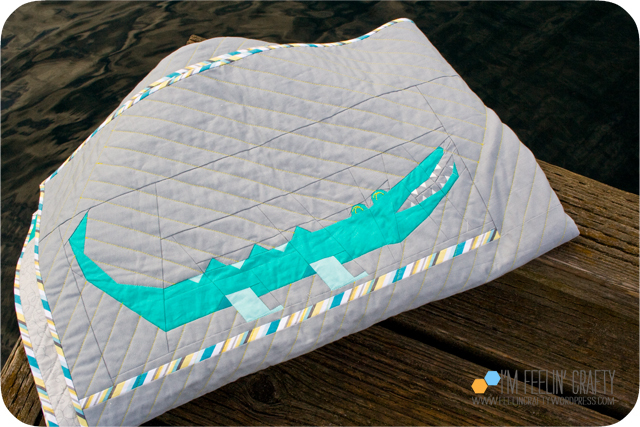 As many of you know I have been working on this ‘gator quilt pattern for quite some time. I have a little bit of an obsession with origami animals, but not so much with paper. I’m no good at making them in paper, so I’ve been making them in fabric. As in in quilt patterns! And the ‘gator is the first one I’ve taken the whole way. The pattern is available on Craftsy! Just click here. I was watching Jimmy Kimmel the other night and they had an animal guy on. He brought a crocodile and was asked the difference between an alligator and a crocodile. The guy said that crocs are a bit grumpier than alligators! So of course, this is the more friendly of the two! I mean don’t those eyes look like the friendliest ‘gator you’ve ever seen? I got this fabric collection last year to make my new nephew a quilt. The animal fabric is Down Under by Mint Blossom for Northcott. I’m not sure that’s it’s still available or not. But the colors were right, so I knew I needed to make one of the animals in this fabric for my paper pieced pattern! So hence came the ‘gator! The pattern is suitable for an experienced beginner to intermediate sewer with paper piecing experience. Some of the testers are pros at paper piecing and others were brand new to it. They all created awesome projects! The pattern includes 28 pages of instructions and paper piecing patterns, including the patterns for the eye embroidery to create a 54×70 quilt. The pattern assumes knowledge of paper piecing and does not include instructions on the art of paper piecing. I should do a tutorial on that soon! I had a wonderful group of quilters and sew-ers and just great people test the pattern for me. I got great feedback on making the pattern much better than I could have done on my own! I owe these ladies a HUGE thank you! And be sure to check out #thegatorquilt on Instagram for some behind the scenes testing pics! I can’t wait to share with you what everyone made! 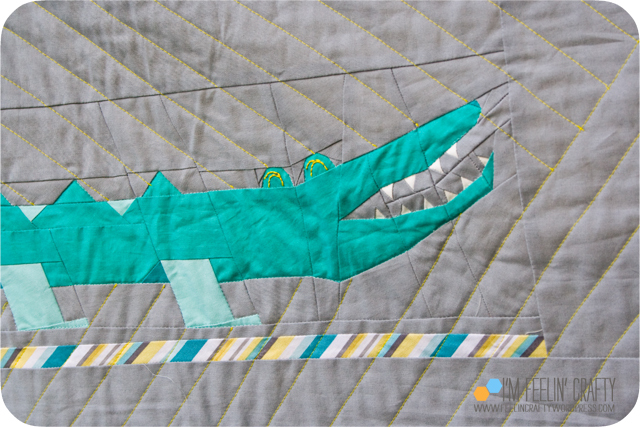 So stayed tuned for all sorts of ‘Gator quilt goodness coming your way! Congratulations – your alligator is fabulous! 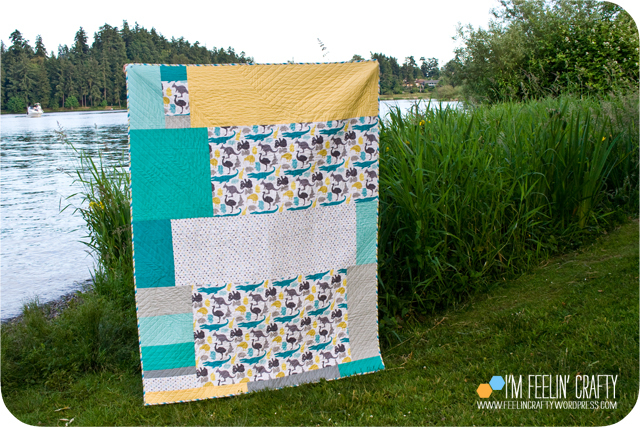 Your finished quilt is beautiful and I can’t wait to see what everyone else made! It truly is a great pattern! Thank you! I’m so glad you could test the whole thing, huge help! Congrats! It is an adorable quilt! 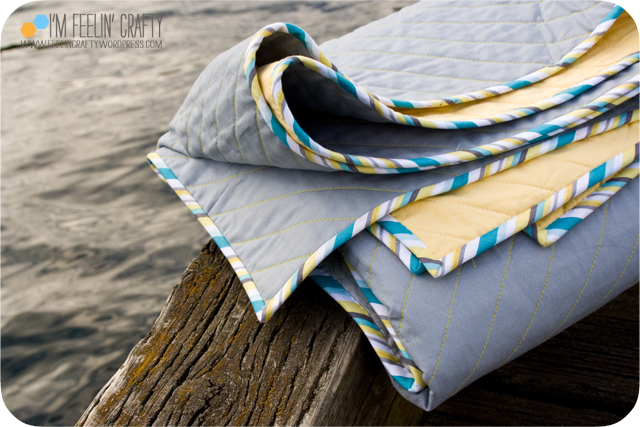 Love your quilt AND this photo setting! What fun to see everyone’s take on your pattern! Congrats btw!! 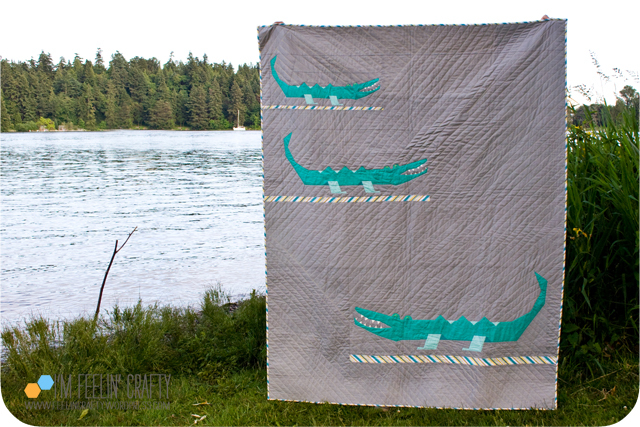 I love the gator quilt! Congrats on your pattern release! The gators are super cute!